Queen Nefertiti of Egypt is probably equally as famous, if not more famous, than Queen Cleopatra IIV. 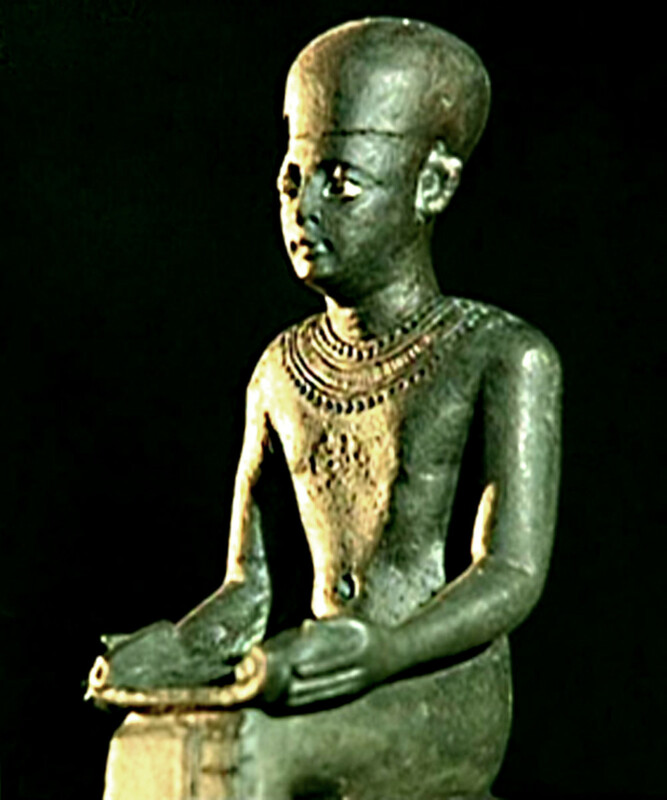 Reigning alongside her husband Pharaoh Akhenaten from 1353 to 1366 B.C. she was a woman of elegance, power, and magnetic beauty. Instead of their being an idealized depiction of the human form, there was now a desire for realism. Nefertiti was depicted in multiple Egyptian artworks and was even seen in tomb paintings and engravings standing beside Akhenaten. This was something that was never seen for an Egyptian queen. 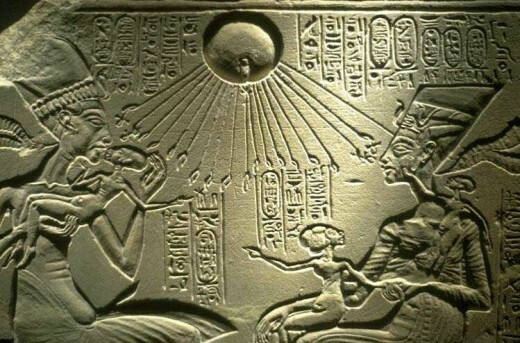 However, Akhenaten viewed his wife as his equal and together they shared the responsibility of ruling Egypt together. 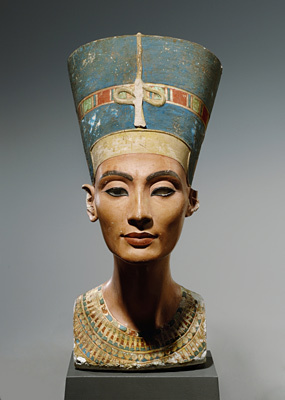 The Bust of Nefertiti is a sculpture of Nefertiti from the shoulders up to her head. It shows the regal and beauty of this mysterious queen. The Bust of Nefertiti is fifty centimeters tall and is made of limestone. It is believed that it was sculpted in 1340 B.C. 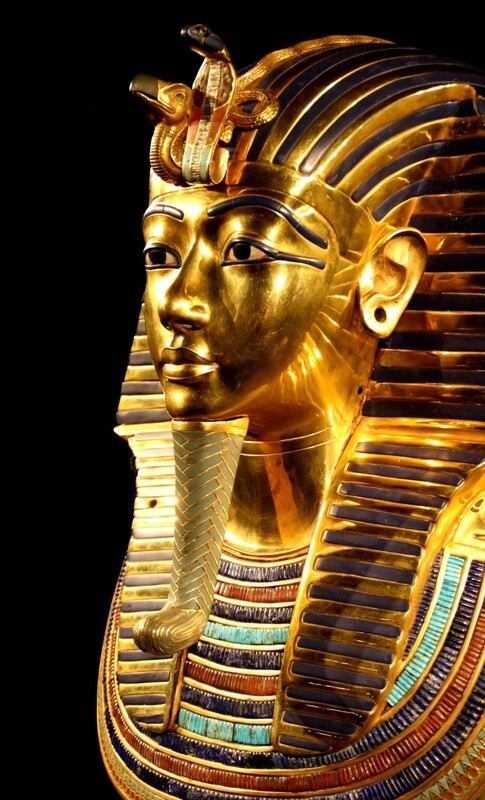 The sculpture ranks as one of the top pieces of Egyptian artworks due to its pristine preservation, symmetrical detailing of the face, and the elaborate colors. 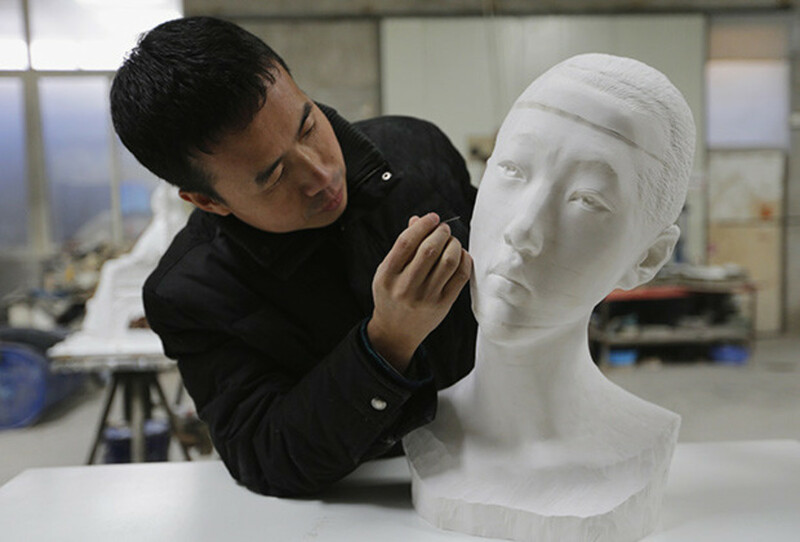 The limestone bust is covered in gypsum, the eyes are decorated with crystal and the pupils are a black wax. Her cheeks are slightly sunken in and there are minor folds under the chin and eyes. However, these features do not take away from the majesty of this work. The face of Nefertiti is harmonious and seductive. She holds her head high and wears her crown gracefully. Around her neck is a colorful, jeweled necklace that could only be fit for a queen. “The sculpture’s facial features are part of the ideals of the Amarna period, such as the elongated neck and emaciated cheeks...Nefertiti may be portrayed more realistically in this piece than any representation of her before this one...the naturalistic detail in Nefertiti’s neck is very unique; the tendons are carved in an extremely life-like manner. 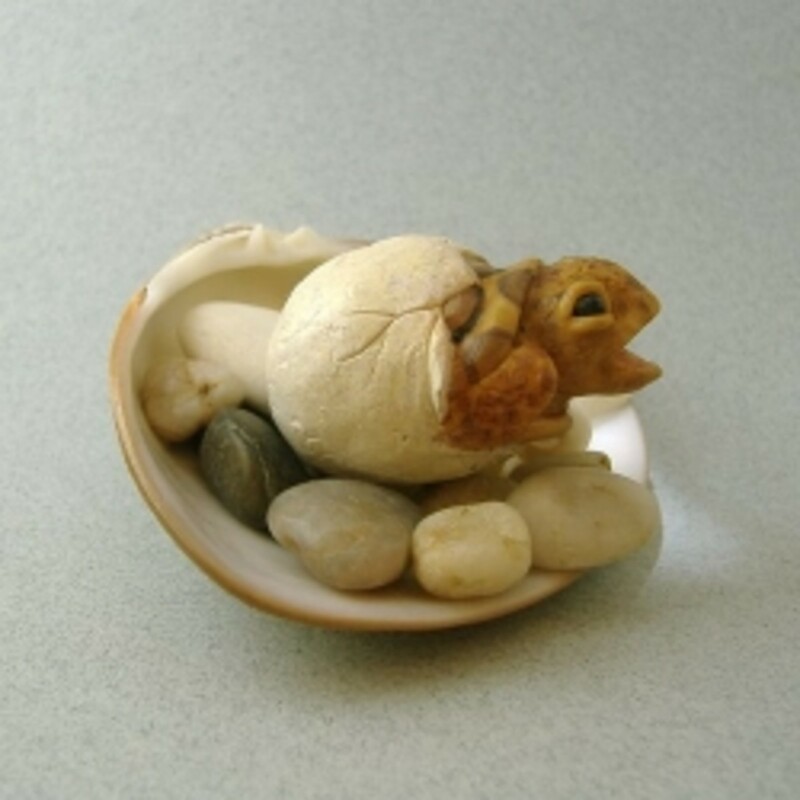 The naturalistic skin tone surely adds to the beauty of the sculpture. Another interesting note is that her eye lids seem to be carved using a slightly abstract style among the naturalistic but idealized features of the nose, mouth, cheeks and chin. The complete lack of hair on a female is fairly unique until the Amarna period. There are reliefs of Nefertiti wearing a true Nubian wig which was usually reserved for men but she is seen most with the Blue Crown as she is seen in this bust. Light cast on the sculpture creates shadows in all of the places you might see shadows on a living female face, such as amongst the tendons of the neck, under the cheeks, lips, chin and nose. The symmetry of the sculpture among all of its naturalism gives it an eerie look of perfection that is unrivaled among all of Egypt’s sculptures." It is said that Nefertiti was one of the most powerful women who ever ruled. 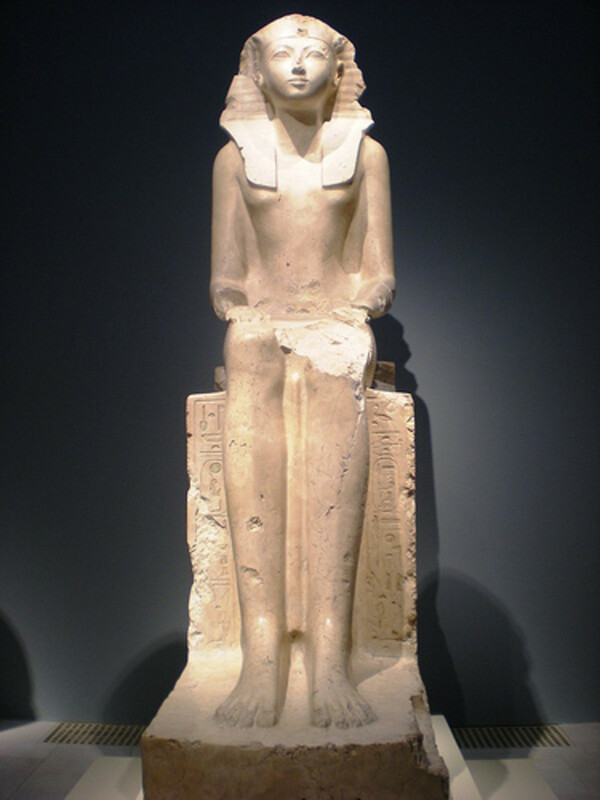 Pharaoh and husband Akhenaten allowed his queen to be portrayed in artwork as his equal and co-ruler. In some artistic works Nefertiti can be seen wearing the crown of a Pharaoh and crushing her enemies. Twelve years after Nefertiti first started appearing in Egyptian artworks, she disappeared. It is debated as to what happened to the infamous queen. Some believe she passed away while others think she became co-regent after the death of her husband and started to dress in masculine attire. Therefore, she would not be recognized in artwork if this would be true. Co-regent has the power equal to that of a Pharaoh. Her mummy still has not been found. Alexander Huppertz, director of the Imaging Science Institute in Berlin states that the Bust of Nefertiti was most likely commissioned by Akhenaten and that he wanted her to be portrayed the same way in which he viewed her. 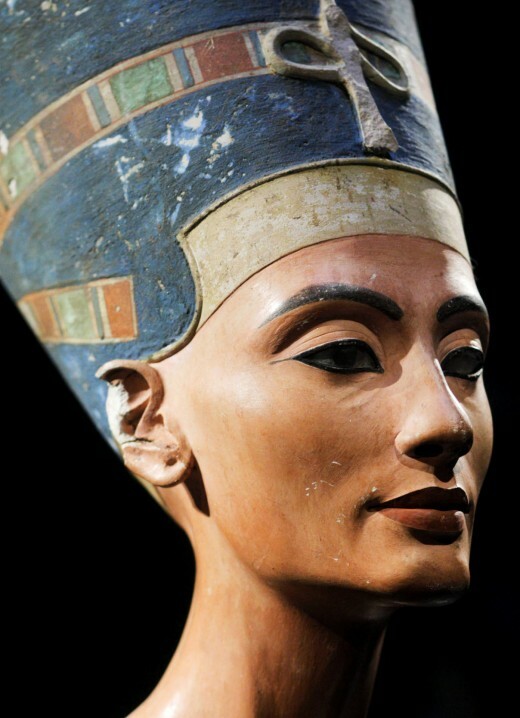 Others suggest that maybe the bust was altered so Nefertiti would be depicted as the ideal Egyptian woman. Regardless, the limestone bust is said to be the Mona Lisa of the ancient world. Interestingly enough, Nefertiti was not of royal blood. 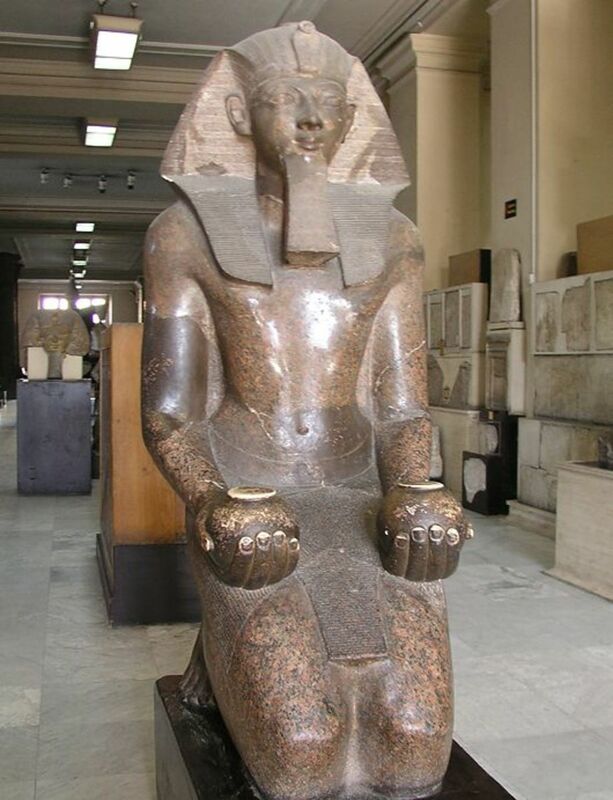 She was, however, close to the royal family because her father, Ay, was a powerful adviser to three pharaohs. 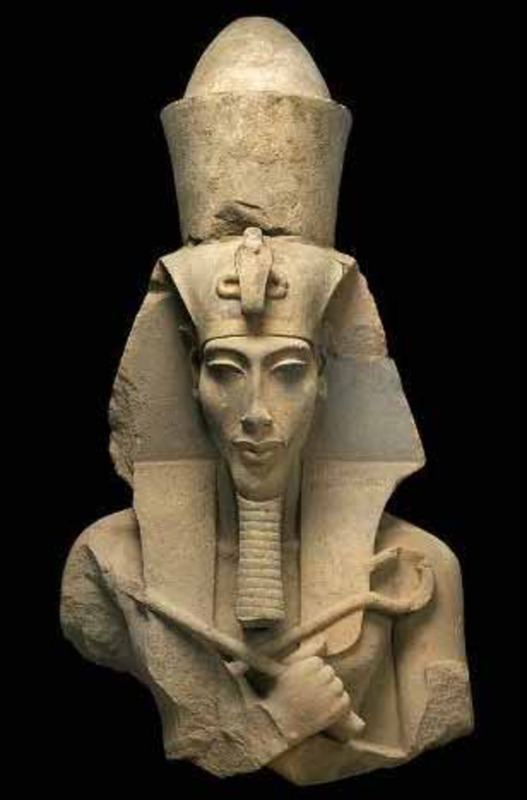 One of them being Akhenaten. While it was not common for someone of royalty to marry a commoner, Nefertiti was particularly special to Akhenaten. They had a strong love for one another, which was also uncommon as well within political and royal marriages. Nefertiti would play a major role in history alongside her husband through a religious upheaval. When large, colossal statues were made of Akhenaten he asked that one be made of equal size of his wife. Likewise, when he performed duties that were only seen of a Pharaoh, Nefertiti also took part. She is known to be one of the most powerful and influential queens during ancient Egypt. Her beauty, charisma, and political agenda changed Egypt and left a lasting impression in history. 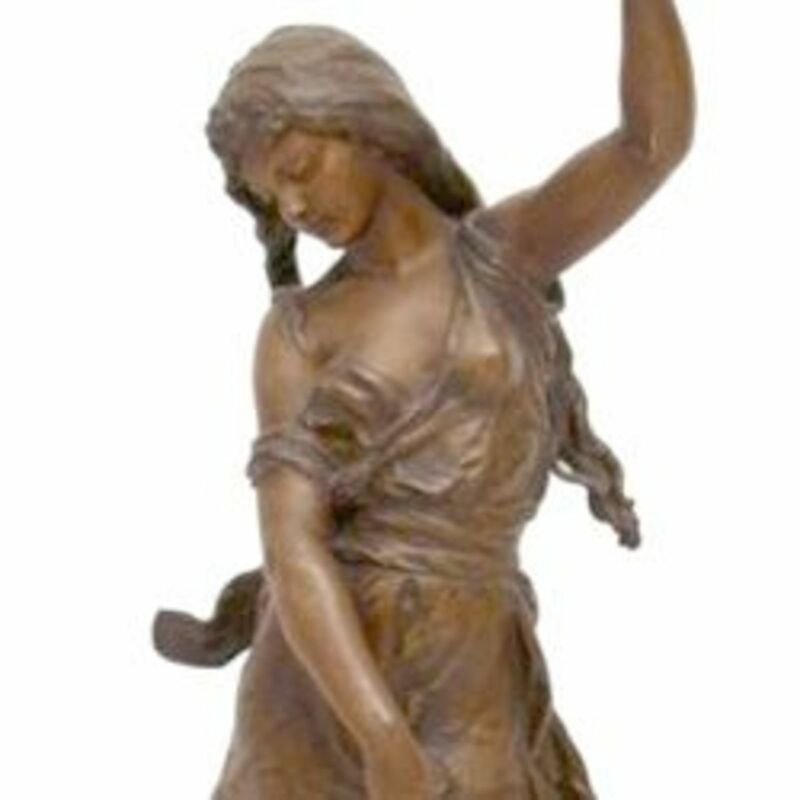 It is a truly remarkable sculpture for the time when it was made, and you are right to emphasise the realistic approach of the sculptor - it demonstrates a talent not so evident in many other ancient works of art. 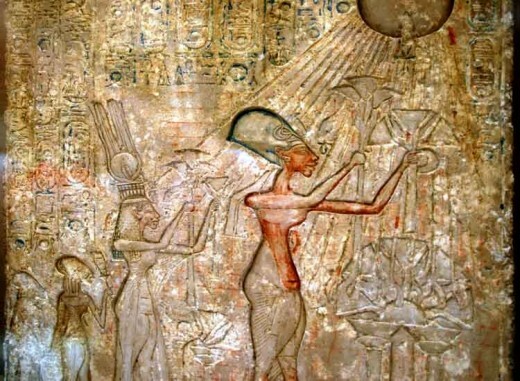 Akhenaten and Nefertiti were a revolutionary couple in many ways - quite dramatically so - and although they ultimately became something of a footnote in history, the whole future world would have been changed irrevocably if their philosophy including their monotheism, had taken hold.